Fishing Expo Madison Wisconsin Update! Wisconsin Fishing Expo to add second floor! Profits to be given away to local fishing clubs/non –profit groups. 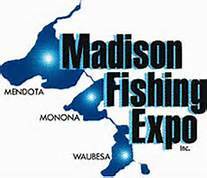 Madison, WI – The Wisconsin Fishing Expo (WFE, formerly known as the Madison Fishing Expo) will produce their largest expo ever, with more exhibitors than ever, including a new second floor! The 2017 WFE will be held February 24-26, at the Alliant Energy Center Convention Hall, and is expected to draw 20,000 anglers. Anglers can expect the same quality vendors, and many new ones as well, but the new second floor will feature a extensive wildlife art gallery with fishing/hunting art, including, prints, paintings, photography and sculpture! There is no extra charge to attend the new feature and WFE will donate all monies earned from the gallery, back to a local fishing-related group of choice. While there has always been great mom-and-pop fishing vendors with gear that anglers simply can’t find at larger brick and mortar stores, there will also be a tremendous presence from some of the leading national brands in the fishing industry, like: Berkley, Beaver Dam, ACME, Fenwick, Okuma, Gamakatsu, Ray Marine, Garmin, St. Croix, Fishing Hot Spots, Stren, and many, many more. As for boats, over 20 brands will be ready to sell from top bets like Crestliner, Alumacraft, Bass Cat, Yar Craft, Tracker, Ranger, Triton, Recon, Smoker Craft, Bennington, and others. The unbeatable seminar speaker line-up offers world-class fishing authorities thanks, in part, to sponsors Hard and Soft Fishing and Frabill/Plano. Big names like Joe Bucher, Larry Smith, “Bro”, Steve Pennaz, FLW Pro Bill McDonald, Lee Tauchen, Jason Mitchell, Adam Walton and others will be on deck and ready to educate. Also, NEW this year will be Madison/Milwaukee favorite, Pat McCurdy, who will perform from 6:00 p.m. – 7:30 p.m. on Saturday. His shows bring in huge crowds and the show is free with a paid ticket to the Expo. Always an Expo favorite, the TROUT POND, will once again include much sought after “tagged” trout, providing lucky anglers who catch a tagged trout a chance to not only take home a trout for the frying pan, but also take home their pick of a prize! It went over great in 2016 and will be back for 2017. Kristen Monroe, the Booth Coordinator for the WFE, said that people should also consider taking a visiting the dozens of non-profit fishing clubs in attendance at the Expo, if they’re looking to get more involved in helping local fishing causes and opportunities. It doesn’t matter if a person is new to fishing or an advanced angler- there is something for EVERYONE at the WFE! Kids 12 and under free. Adult ticket prices are $10. Sponsored by: Subway, Wisconsin Outdoor News, Outdoor Wisconsin, WKOW TV, Hard and Soft Fishing, Plano/Frabill, National Professional Angler’s Association, Future Angler Foundation, The Big 1070, and Don’s Marine.